I have been so crazy obsessed with knitting these days that I barely do anything else, as in other crafts. I just got the hang of knitting and have not realized what I have been missing all this while. I kept thinking crocheting is pretty much the same thing with different tools wielding similar result.. but boy was I wrong. Knitting opened a whole new world of opportunities that I had never knew until recently. It's snowing right this very moment, and I think it's a really nice birthday gift from nature to me. Last year around these time, I was anxiously hoping for it to come but it didn't. I was told by my, then future in laws that I had brought the Malaysian heat with me and that nature was being kind to not freeze me too much with my moving here. I cannot believe it has been a year since I officially left what I thought, was going to be where I will be for the rest of my life. I love traveling and always thought it would be an interesting experience living abroad but never have I thought it would be something that I will actually do! "What do you miss the most?" It's not really that bad, actually. It's not the same but I'm pretty good about adapting to changes. Part of which I think I owe to the transfers experienced during my service in the mission. It's always sad to leave when you are comfortable and have made many friends, but at the same time going to a new place brings another whole new adventure and excitement. So my answer to those common questions asked was always, "It's okay, actually." What only made it hard is being pregnant and craving for Malaysian food. Clifford is constantly hounding me on what I want for my birthday.. I really don't have anything pressing that I want. I have pretty much everything I need. My wonderful mother in law surprised me with an early birthday gift of an amazing sewing machine. Clifford is getting me a knitting set. I have gift card for a fancy fabric store from the sister in laws & their husbands, and snow came right on time. At 33 weeks pregnant, and a baby that is making her presence known with her movements and occasional, what I feel like is scrapping inside the womb, I only hope that things will just continue to be great and that I can continue to be a better person in every way possible. My food cravings, as of late, (which I'm pretty sure is coming from my husband's side of the baby is making it's presence known) - are milkshakes, ice creams and anything chocolate. The worse part is that I can take huge amounts too. Amounts that is abnormal to my usual self. I hope that goes away or I will have difficulty getting back in shape nor staying in shape for that matter. Realised that I haven't read your blog for the past weeks. I know I sent you birthday greetings but this is "happy birthday" again in response to your posting. I forgot why you were, as you were, in this birthday picture. You didn't want to pose for picture, right? 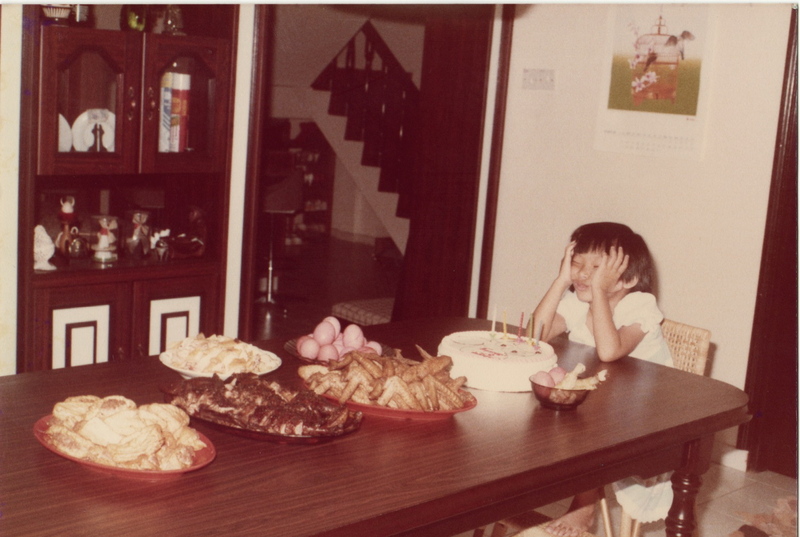 That was your 5th birthday, right, a month after Yean was born?